Wait, did I actually take a walk this weekend? Yup! And it's mostly because it actually felt like spring. There's still a little snow left on the ground, but some flowers actually have the audacity to poke out of the dirt. This might just be NY's version of "It's spring, I guess." Spring also means Easter, which means you'll need something impressive for your family get together. If you don't normally have a beautiful spring pizza on your Easter brunch menu, think again. 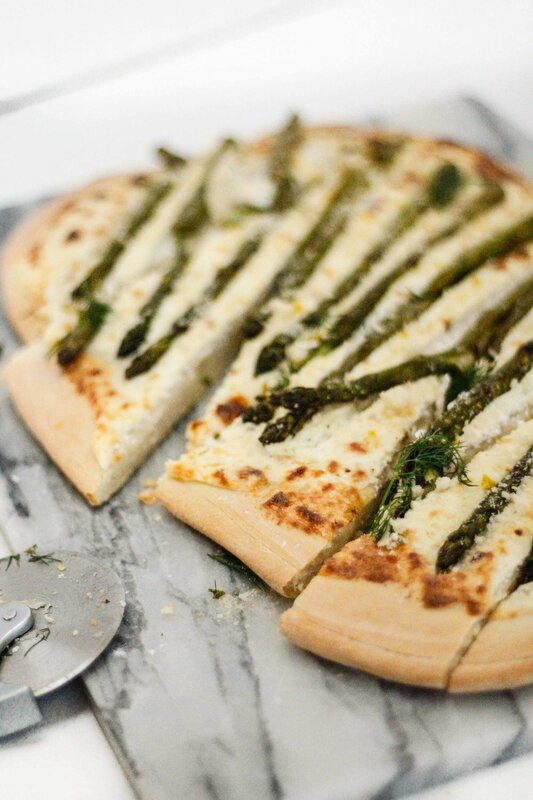 Because what screams spring more than pizza? 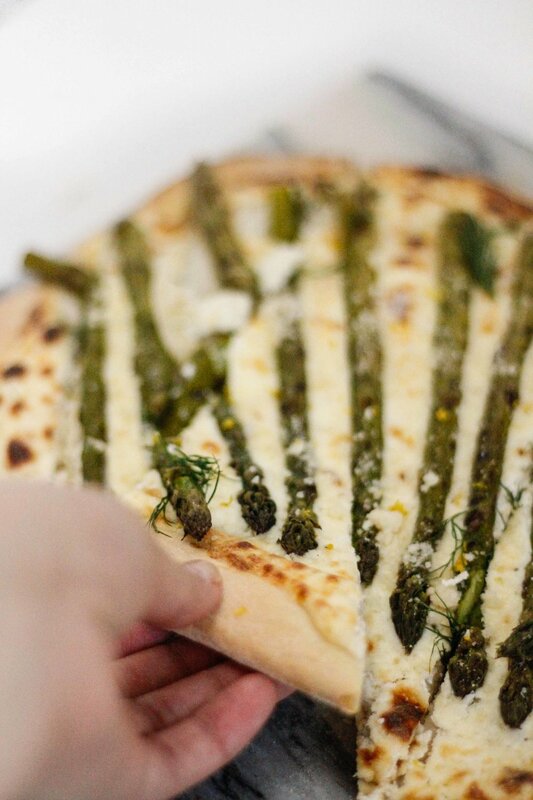 Well, there's much more that's spring-like than pizza, but I think the asparagus, dill and lemon zest on this one will make up for that. A simple self-rising yeast pizza dough recipe will work for the base. I used a simple recipe from Mark Bittman (via How to Bake Anything) and it was real easy, but you can use store-bought dough for this little guy too! The ricotta and pecorino is the "sauce" of the pizza, because every pizza needs some cheese! Note you MUST add the dill and lemon for that spring flavor, but just a little since both flavors can overpower anything fast. Trust me, this one's a keeper and the recipe is below! Start by grilling your asparagus. You can grill it on a lightly oiled griddle pan, or feel free just to sauté it if that’s easier. Cook them until they’re slightly charred, and not nearly as fibrous as they began. Set aside. Roll your dough out on a floured surface into a large rectangle. It should be able to fit on a standard baking tray. Transfer the dough to the baking tray and set aside. Mix together the ricotta, pecorino romano, and red pepper flakes in a bowl. Add a generous pinch of salt and pepper to season. Spread this mixture evenly onto the pizza dough, leaving a border around the edges for the crust. 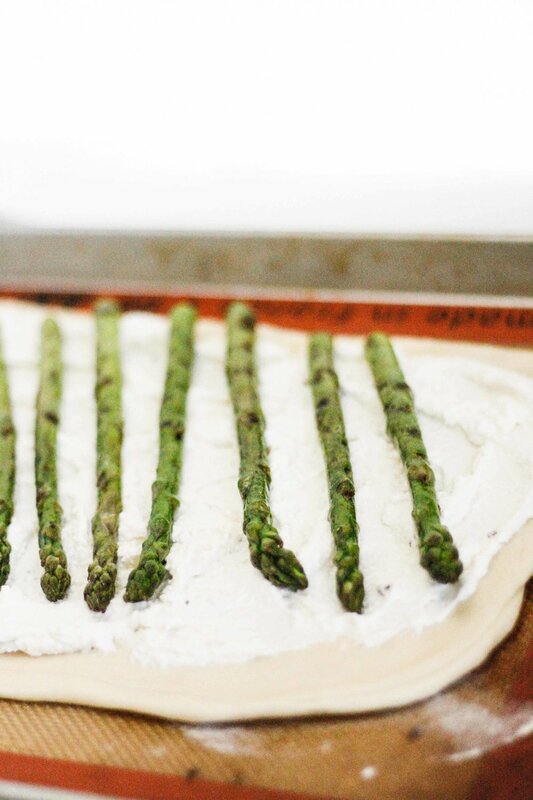 Layer the asparagus in a diagonal line across the entire pizza. Bake the pizza in the oven for 20-23 minutes until the dough is cooked through and golden. Remove the pizza from the oven, and top it with more pecorino romano, dill and lemon zest. Slice and enjoy warm.